The BBC Coast Team have been busy last week, filming a show on the Exercise Tiger story,They flew in from the US survivior Steve Saden and his wife Helen for a few days filming at Slapton ,South Devon. They also took a trip out to the wreck site's ,.the show will be going out next spring, under Bournmouth to Plymouth. I watched the BBC's Coast Team's efforts regarding the tragedy of Exercise Tiger - quite disappointed really - the program did not once mention the initial shelling of the landing area by the USN and RN ships (all part of the tragedy that was 'Tiger') - nor was there mention of the dogged perseverance of Mr Ken Small who brought the whole sad episode of 'Exercise Tiger' into the open here in the UK - even the Wreath was laid upon 'Ken's Tank' without mentioning that it was that man's personal tribute - and that Tank still remains the only Memorial dedicated to that incident. I to saw the piece on Coast, guess better than nothing at all but as you say, not an in depth piece. My own personal view (not necessary of the bmpt) is that this type of docu-drama 'journalism' - if that is the correct term - will never reflect to 'our' younger generations just what sacrifices were (and still are) being made so that we can enjoy our way of life. Sad really - but as you say -"guess better than nothing at all"
Have had some little information - that it could have been boats of the 55th Flotilla that were lying off Cherbourg that night - then just to confuse things a little - from another source - that.. "they were from the 52nd Flotilla"..
As part of the "younger generation", just the slightest bit of information may spark the imagination of someone, If I hadn't spoken to my grandad about an MTB he bought in the 50's to use as a Motor Yacht I would never have joined the forum, got involved with helping on an HDML or have any interest whatever! I think it's a good start to people wanting to know more! Isn't that the point that Pioneer (or is it Ted??) was trying to make - that it was not part of a school curriculum but talking to your Grandad that 'sparked' your interest? and if Grandad was a veteran of WW2 you may understand that you have a far greater insight of what really happened than most. Good on your Grandad rozm2!! 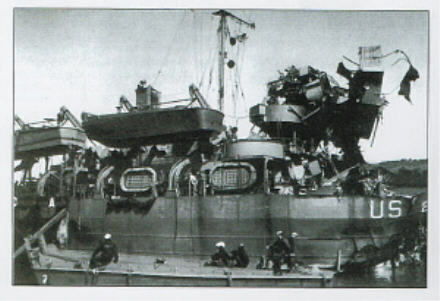 I came across this remarkably sharp image of LST 289 in Dartmouth taken shortly after the tragedy, showing the considerable damage to a gun mounting. A well known shot - I've seen it before - but the clarity in the original is quite something - unfortunately not able to 'reduce' without losing some of the clarity.